Over my years of teaching, I have changed very few student's embouchures. I prefer to think of embochures evolving into what the player needs to be successful. We certainly will not all look the same when we play in the third octave or when we have quick wide interval skips. You must remember that each of us is a different size--I have students ranging in size from 6'4" down to elementary sized students. Yet, we play the same sized flute. Each of us has a different face--some lips seem to aways be in a smiling position at rest--others have more of a downturned expression and then most of us are a combination of the two--one side up and other side down. So, obviously each of us will look different when we play the flute. Do check out the flute embouchure pictures for Roger Stevens' book ARTIST FLUTE on Larry Krantz's web site. Each of these players has a professional sound, but look at how differently each is set up. I would suggest you let your ear direct your embouchure changes. Work for sound and agility and when you have it where you want it, you will look like what YOU need to look like to get the best results. Playing lots of harmonics will help you in this area. I prefer playing the Marcel Moyse DE LA SONORITE at the harmonic (third partial with the lowest note counting as partial no. 1). For me, I get a much better and quicker benefit from doing the book this way. Control in the third octave is as much about the air stream as it is embouchure. Size and speed--two important air stream S's. Most problems occur when the flutist does not keep the air stream moving. When things begin to sound rough, they stop blowing and everything gets worse. Playing and practicing a lot in the high range will help you feel comfortable. Besides doing the Taffanel and Gaubert 8va--check out Thomas J. Filas--Leger Domain and Top Register Studies. I have the students double and triple tongue each note the first time through these books. Then various rhythmic patterns before setting in with the slurs. Practice with a metronome at both slow and fast settings. Control is being about to play very fast and very slowly. *Note: This article first appeared in the "Teaching Tips" section of Larry Krantz's website. 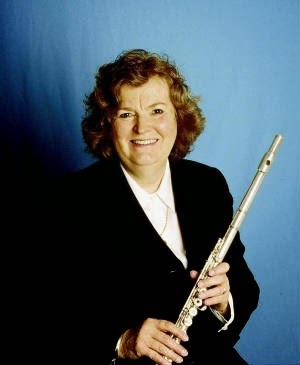 Patricia George, Editor of Flute Talk magazine, is the flute professor at the Sewanee Summer Music Festival and the American Band College. She tours the US giving Flute Spa masterclasses for flute clubs and universities. She is the co-author of Flute 101: Mastering the Basics, Flute 102: Mastering the Basics, Flute 103: Mastering the Basics, The Flute Scale Book and Advanced Flute Studies: The Art of Chunking which are all published by Theodore Presser. She is a graduate of the Eastman School of Music and studied with Frances Blaisdell, Joseph Mariano, William Kincaid and Julius Baker.